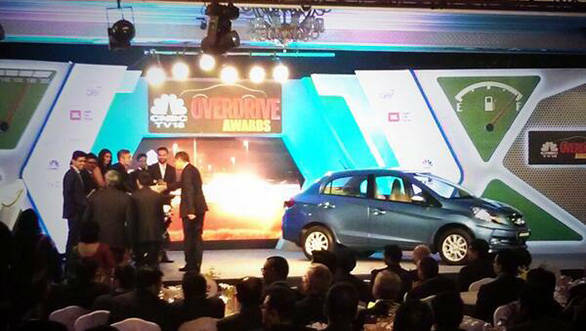 Honda Amaze has edged the Ford and the Hyundai to bag the 2014 CNBC TV-18 OVERDRIVE Car Of The Year Award. The Amaze is Honda's answer to the Maruti Swift Dzire. Designed while keeping Indian tastes and duty regulations in mind, the Amaze has ever since been spearheading Honda's revival in the Indian market. The Amaze is also Honda's first diesel car in India. Its 100PS 1.5-litre i-DTEC engine is a marvel and has a smooth and linear power delivery. It also has the highest fuel efficiency in its class. The petrol engine is the familiar 1.2 i-VTEC from the Brio and isn't short in performance either. Class leading cabin space and an overall strong feature list makes the Amaze the 2014 CNBC TV-18 OVERDRIVE Car Of The Year. At the awards ceremony in Delhi, OVERDRIVE paid tribute to deceased Tata Motors MD Karl Slym. There were 15 cars from four main categories in the running for the top honours. The Hyundai Grand i10, Volkswagen Polo GT, Toyota Etios Liva Sportivo, BMW 1 Series and the Mahindra e2o in the Small Car category; Volkswagen Vento TSI, Honda Amaze and the Skoda Octavia in the sedan category; Nissan Terrano, Ford EcoSport, Honda CR-V and the Mercedes-Benz GL 350 CDI in the SUV segment; and Mercedes-Benz E-Class, BMW 5 Series and Toyota Camry Hybrid in the Executive Car segment. The main categories were judged on the basis of the build quality, ride and handling, styling (exterior and interior), value for money and affordability, engine and transmission and fuel efficiency. Passenger vehicles that were launched in 2013 were eligible for the OVERDRIVE Awards 2014. The 15 cars were driven by our esteemed six-member jury : Bosch Chairman VK Viswanathan, Air Asia CEO Mittu Chandilya, five times rally champion Hari Singh, Himalayan Motorsport president Vijay Parmar, OVERDRIVE editor Bertrand D'souza and ex-OVERDRIVE executive editor Vikrant Singh. All the 15 nominees were taken to the Chennai race track and tested on all the parameters by our esteemed jury members for two days. While the jury members came away impressed with most of the contenders, they were more taken in by some cars than the others. The jury selected Hyundai Grand i10 as the Small Car of The Year, Honda Amaze as the Sedan of The Year, Ford EcoSport as the SUV of The Year and the Toyota Camry Hybrid as the Executive Car of The Year. Besides that, there were special categories for the Import Car and Import SUV of the Year which was won by Mercedes-Benz B-Class and the Range Rover respectively, while the U2 that powers the Hyundai Grand i10 won the Engine of The Year. For their remarkable achievements in motorsport this year, both Jehan Daruvala and Gaurav Gill were awarded 2014 CNBC TV-18 OVERDRIVE Motorsport Personality of The Year. In the motorcycle category, KTM 390 Duke has been awarded the 2014 CNBC TV-18 OVERDRIVE Bike Of The Year.